55-Inch Mi TV 4S, 50-Inch Mi TV 4C Launched; Mi A2 Specs Leaked! The Mi TV 4S will sport a 55-inch 4K HDR display while the Mi TV 4C will have a 50-inch 4K HDR display. Both will run the same Android-based PatchWall UI. Within six weeks of its launch, Xiaomi has done a pretty well job in the Indian TV market after a series of sold-out flash sales. But the company has not forgotten its home market and has launched two new TVs with 4K HDR displays and Dolby Audio. While it announced the 55-inch Mi TV 4S last week, it announced the 50-inch Mi TV 4C in China today. Both these new TVs will run the same Android-based PatchWall UI that powers all its latest televisions. Both of them will ship with Mi’s Smart Remote Control which adds gesture and voice support to the TV viewing experience. Both the new TVs essentially have the same internals and software support. The only difference is in the display sizes and design. Let us take a look at some specifications of both these TVs. The Mi TV 4S will feature a 55-inch 4K HDR IPS LCD display with direct-type backlighting and 178-degree viewing angles. It has a refresh rate of 60Hz with 8ms dynamic response time. The Mi TV 4C comes with a 50-inch 4K HDR LCD display with the same 178-degree viewing angles. This panel has a 9.5ms dynamic response rate. Both these TVs run on Android-based PatchWall UI just like its predecessors. The UI comes equipped with deep-learning AI technology which works on different algorithms to learn preferences and interests of a user to offer a more curated and customised content. The Mi video player app now allows playing both, online and offline, videos. The hearts of both these TVs are powered by a quad-core 1.5GHz Amlogic Cortex-A53 chipset coupled with 750 MHz Mali-450 MP3 GPU and 2GB of RAM. It has 8GB internal storage and comes with Mi Smart Remote control that allows gesture and voice support. The Mi TV 4S and the Mi TV 4C have the same audio capabilities. Both have two 8W stereo speakers which support wide Dolby audio and DTS-HD decoding which will supposedly give a powerful and a clear output. Both TVs feature Wi-Fi 802.11 b/g/n connectivity on board with Bluetooth 4.2 LE. They have HDMI ports, USB ports, AV ports and Ethernet connectivity. Other than the display size, there are no big changes on the inside. The new Xiaomi Mi TV 4S is priced at around CNY 2,999 (around Rs. 31,100) while the Mi TV 4C is priced at CNY 2,199 (around Rs. 22,700). While the 55-inch Mi TV 4S will go on sale on 3rd April in China, there’s no word on the availability of the 50-inch Mi TV 4C. There’s also no word from Xiaomi on the global availability of the Mi TV 4S. Xiaomi’s C series products are usually reserved for its home market, China. So, while the chances of the Mi TV 4C being available outside of China are slim, the Mi TV 4S might just make it to the global markets. We just don’t know when. The Mi A1 is one of the most-sold Xiaomi devices in India. The dual-lensed smartphone was the first ever Xiaomi device to run stock Android, and the smartphone was a smash hit in the country. The smartphone which was sold as the Mi 5X in China received a new life with stock Android and a rear dual lens in a slim body. As per a series of leaks, the Xiaomi Mi A2 will be launched in China soon as Mi 6X with MIUI on board. The same device will be launched globally as Mi A2 with stock Android on board. The previous leaks hinted at the design of the Xiaomi Mi A2 specifically, where the device was seen in an edge-to-edge display with a dual rear camera in a vertical set-up just like iPhone X. The latest leak sheds light on the rest of the specifications of the Xiaomi Mi A2. The Mi A2 will come in a metal build and a full-screen design. The bezels on the sides are extremely thin, and the upper and lower bezels are much thinner than the Mi A1. The Mi A2 will come with a widescreen 5.99 inch IPS LCD display in an 18:9 aspect ratio with a screen resolution of 2160 x 1080 pixels. The device will see an upgrade over Snapdragon 625 and will come with an octa-core Qualcomm Snapdragon 626 clocking at 2.2 GHz, coupled with 4GB of RAM. Mi A2 will have 64GB of internal storage which can further be expanded with an external microSD card through the Hybrid SIM Slot. Mi A2 will run stock Android 8.1 Oreo out of the box in its global avatar. 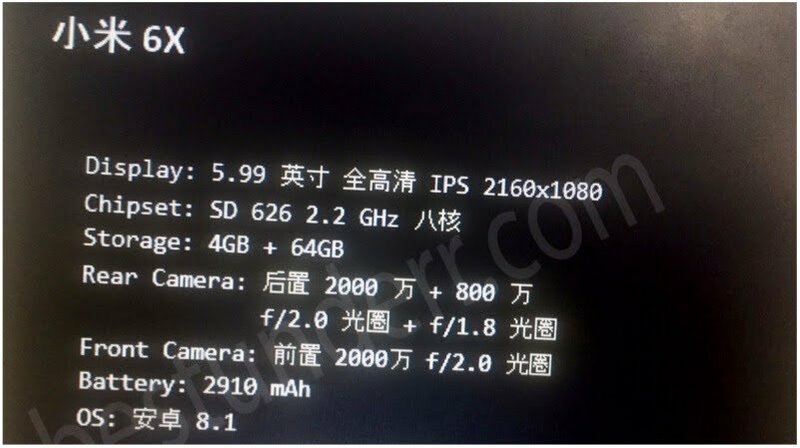 In China, the Mi 6X will run the latest version of the MIUI. Mi A2 will sport a dual rear camera, just like it’s predecessor. The device will boast a 20MP and 8MP sensor with a f/2.0 and f/18 aperture respectively. Up front, the device will come with a 20MP sensor with a f/2.0 aperture. The Mi A1 will be powered by a 2910 mAh non-removable battery. In comparison, the Mi A1 shipped with a 3080 mAh battery unit. "55-Inch Mi TV 4S, 50-Inch Mi TV 4C Launched; Mi A2 Specifications Leaked! ", 2 out of 5 based on 10 ratings.